It was supposed by WILSON, and since his time by others, that this brilliantly coloured Ibis is not uncommon in the southern parts of the United States. 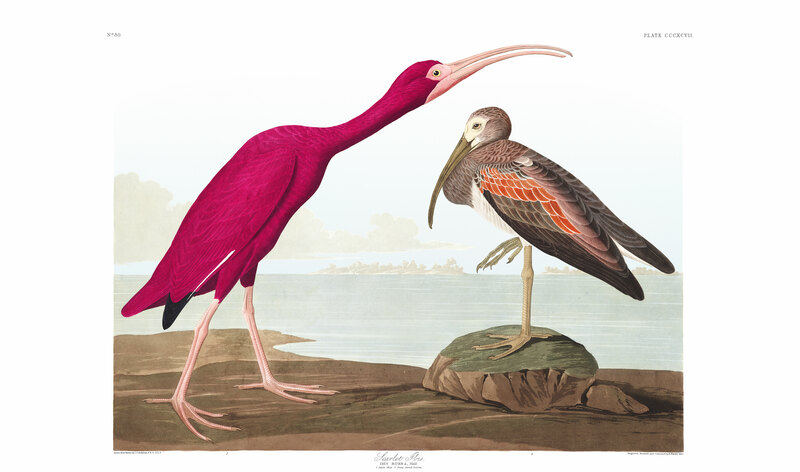 This opinion, however, is quite erroneous, and I have found the Scarlet Ibis less numerous than even the Glossy Ibis; indeed I have not met with more than three individuals in a state of liberty, in the whole range of the United States. These birds occurred at Bayou Sara, in Louisiana, on the 3d of July, 1821. They were travelling in a line, in the manner of the White Ibis, above the tops of the trees. Although I had only a glimpse of them, I saw them sufficiently well to be assured of their belonging to the present species, and therefore I have thought it proper to introduce it into our Fauna. WILSON'S figure, I believe, was taken from a living specimen, not, however, procured within the limits of the United States, and which was kept for some time in Peale's Museum in Philadelphia. My drawing of the adult male, and that of the immature bird, were made from specimens also procured beyond our limits. It is said that the habits of this bird are very similar to those of the White Ibis, of which I give you a long account; but, as I have not had opportunities of observing them, I judge it better to abstain from offering any remarks on this subject. SCARLET IBIS, Tantalus ruber, Wils. Amer. Orn., vol. viii. p. 41. IBIS RUBRA, Bonap. Syn., p. 311. SCARLET IBIS, Nutt. Man., vol. ii. p. 84. SCARLET IBIS, Ibis rubra, Aud. Orn. Biog., vol. v. p. 62. Adult, 29; wing, 11 1/4. Accidental. Three specimens seen by me in Louisiana. Bill, feet, and bare parts of head, pale lake; plumage bright scarlet, excepting the quills, which are white, and the terminal portion of the outer four primaries, which are bluish-black. Young in first plumage with the bill and feet brownish-grey, the bare parts of the head pale flesh-colour; plumage of head, neck, and upper parts, brownish-grey, of lower, white.